Sign up and receive Property Email Alerts of Freeholds for sale in Uvongo, South Coast. If you looking for class and luxury living, then this impeccable home is the one for you. On entrance you have a beautiful kitchen with lovely granite tops and built-in cupboards, a TV room, two bedrooms(one of which is an en-suite) and open plan living areas that leads out onto an entertainment area with a built-in braai, a swimming pool, a jacuzzi and also overlooking the amazing sea views and gardens. Heading upstairs you have a second kitchen/bar with an open lounge and dining room that leads out onto a balcony. 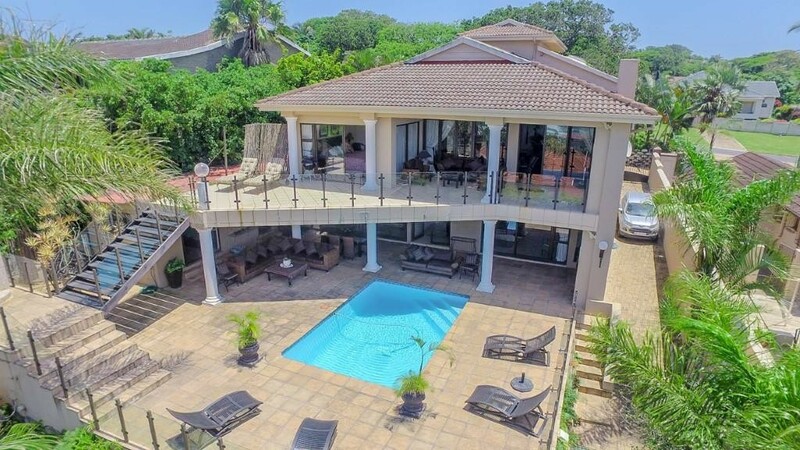 On this level you have three bedrooms, two bathrooms, your master bedroom that is en-suite, leads out onto the large balcony that is equipped with a built-in braai, overlooking the sparkling blue pool and elevated sea views. With having two driveways and two entrances, basically two of everything, this massive family home can easily accommodate two families. The property is fully walled, has an automated entrance, fitted with an alarm system, outdoor beams and an intercom for a peace of mind. Sign-up and receive Property Email Alerts of Freeholds for sale in Uvongo, South Coast.